The sea lion enclosure was carefully designed to sit within the castle moat, whose arc its curves follow. The proposed location, just beneath the curtain wall of the castle, called for sensitivity in its design and prominence. 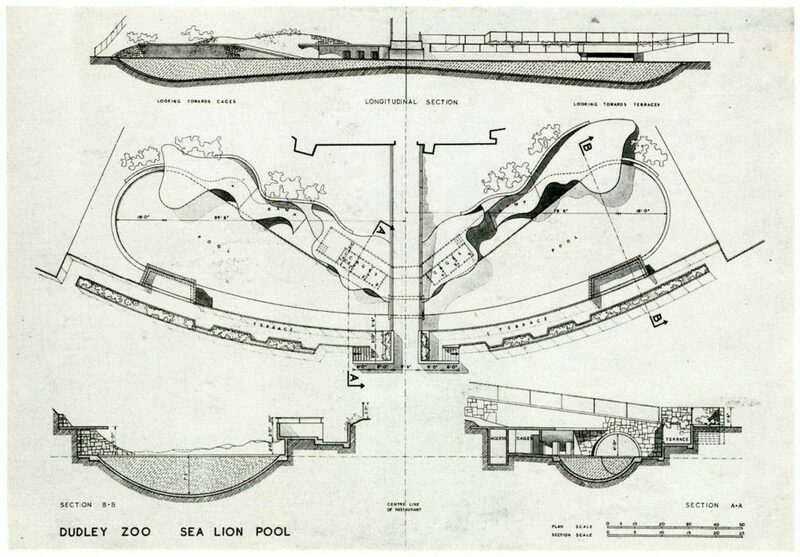 The long, low profile of the pools and the associated structures to the rear was intended to be inconspicuous, providing a large area for viewing the animals without compromising the view of the castle. In order to provide a visual link with the castle and avoid too great a clash between the old and the new, the retaining walls to the rear of the sea lion pools, and the bridge passing between, were constructed in local rubble stone. The enclosure was later adapted to house dolphins, and in the 1970s walls were added to the perimeter to increase the volume of the pools in order to accommodate a killer whale named Cuddles. The additional salt used to aid the whale’s buoyancy accelerated the deterioration of the structure, which underwent extensive repairs in the 1990s to once again allow the housing of sea lions. The pools received some repair and restoration work again in 2015.